Swimming last weekend at a small local meet in Auburn, Alabama, a group of Brazilian Olympians showedd up to put a charge into a meet that otherwise was mostly high-school aged swimmers. 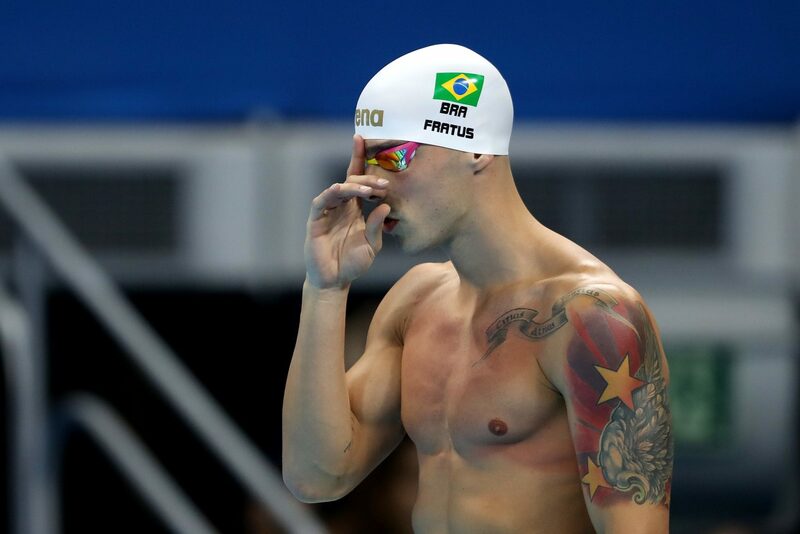 Bruno Fratus, Marcelo Chierighini, and Felipe Lima all raced at the meet in two events each. Fratus and Chierighini raced head-to-head in the 50 and 100 meter freestyles, with Fratus winning both races. In the 50, he swam 22.02 to Chireighini’s 22.64; in the longer race, the margin was closer, with Fratus finishing in 49.11 and Chierighini taking 2nd in 49.28. Lima swam the 50 breaststroke (27.40) and 100 breaststroke (1:00.03) – in both cases, Cobi Lopez Miro, son of Auburn associate head coach Sergio Lopez Miro, took 2nd. All 3 swimmers are a part of an aging nucleus of Brazilian stars. Chierighini is 26, Fratus is 27, and Lima turned 32 on Wednesday. Fratus was unceremoniously-dumped from his former club team Pinheiros due to his age, but announced this week that he will join the club Regatas for domestic competition. And Bruno took time for every age group kid at that meet to sign autographs and take pictures. Class act. For some reason, Brazilian teams seemed determined to force all over-25 swimmers out of competition. I do not know Pinheiros’ current roster, but I doubt anyone of them could swim 22.0 this week.